By popular demand I am here with a weighted blanket review! I've only been using it for the past month so I am by no means an expert in this but just wanted to share my thoughts! First just want to mention that the bedroom is currently under construction (not really) -- and you can see how the bed really looks dressed up HERE. We're currently figuring what we're trying to do with our bedding after some minor issues with Dixie! OK the weighted blanket... I posted this randomly on IG stories and got so. many. dms. about it my head was spinning. I originally got a weighted blanket for my mom for Christmas -- one because I thought she would love it -- and two so I could try it out too! I've been hearing great things about weighted blankets and the benefits behind them. The number one thing being sleep -- you fall asleep quicker and stay asleep longer. You can read more about the study HERE but it talked about how, when using the blanket, they had less movement during sleep and subjectively said they had better quality sleep. There have also been a lot of studies on the treatment of touch therapy and something that I have personally used in my life. Perfect real world example was THIS scene during Grey's Anatomy. Dr. Dixon talks about how body pressure calms the nervous system. Not the most scientific thing, but you get the idea! I've used this practice quite a few times with Andrew when I have anxiety attacks and it has been able to clam me down. A little quick backstory about me, I have ADHD, struggle with anxiety and anxiety attacks (I would say a little more than 10 a year) and have dealt with depression for most of my life. I have never talked about it on the blog but it's not because I try to hide it or is something I'm ashamed of -- just something I never totally thought relevant to share. I wanted to share now only because I wanted you all to know exactly why I wanted to try out and why I eventually bought this blanket. You're supposed to get a blanket that is 10% of your body weight -- but I ended up getting a 20lb blanket. My exact blanket unfortunately is not online to buy but it's a 60" x 80" blanket and covers most of my queen bed (you can see above). I bought my moms blanket of Amazon but they also have a ton of great ones on Etsy! What you need really (and it's how my blanket is set up) is the weighted blanket itself and a slip cover for it. Some are sold together and some come separate! Weighted Blanket Review - It's not hot. You would think something so heavy would be hot but it's not! It's actually pretty great and Andrew -- who always runs hot didn't even complain about it! Weighted Blanket Review - It IS heavy. I'll be the first to admit that it's not what you're used to. You're used to moving around freely and that is just no longer the case and because you're comparing it with a normal blanket, it is HEAVY. I think its just about personal preference. I will say that I have gotten used to it and I have tried sleeping without it and woke up in the middle of the night to retrieve it and continue sleeping with it. Weighted Blanket Review - It has helped with my sleeping. I've never had a problem with sleeping but it has helped me sleep better. I fall asleep much quicker than with my normal blanket and I think that is due to the fact that I'm more relaxed with the pressure. I think it also helps subside my ADHD from moving and flipping around. The blanket also stops tossing and turning (because its too heavy to do when you're sleeping TBH) and I find that I will fall asleep on my back and wake in the same position in the AM. Weighted Blanket Review - I have crazy dreams. I think it's because I'm in a deep sleep so I'm in a longer and deeper REM cycle but woah my dreams are crazy specific, real and detailed. My mom has said the same thing! 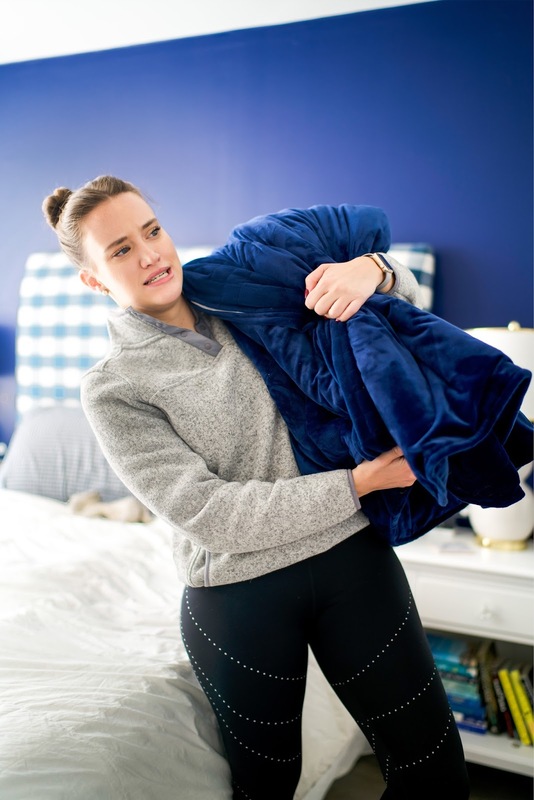 Weighted Blanket Review - It's NOT ideal for a partner who doesn't like it. Andrew tried it the first few nights with me and didn't like it. He says it is too restrictive and he likes to move around when he's sleeping. He thought it might be better as a nap blanket (which I do think is a great idea for it). But one thing that has changed is he hasn't had any night terrors with it (something that happens when he sleeps and tries to wake himself up by screaming). It's hard that he doesn't want to sleep with it anymore only because he'll push it to my side or it will hang off the bed and make it 100x heavier -- to where it is too heavy for me and I get uncomfortable (and ironically will get anxiety attacks). We're still going to try and find a way it works for both of us but that is still TBD! Weighted Blanket Review - I love it. I really like it and I would suggest it to others who have sleeping problems or anxiety -- just because I believe those are the areas where it has really helped. They are expensive so that's why I'm not shouting to everyone to buy -- I don't want you to waste your money and turn out like Andrew who doesn't like it.